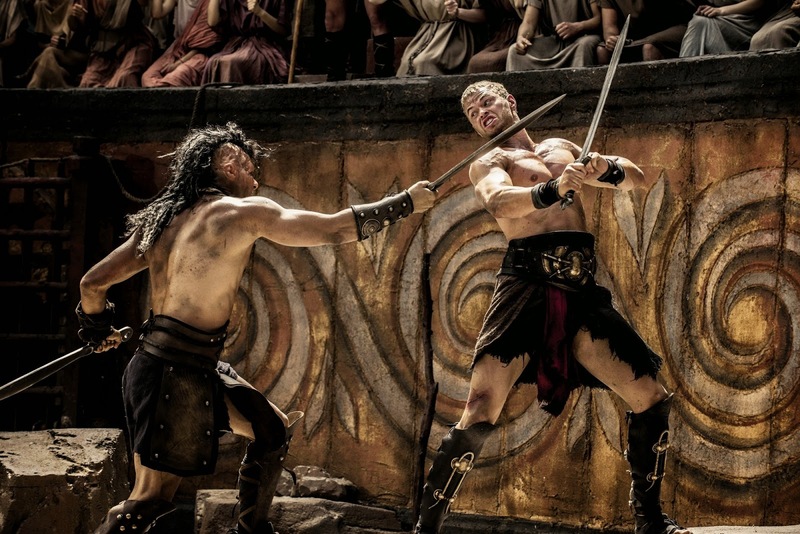 Before 300: Rise of an Empire, before Hercules: The Thracian Wars, we get 2014's second wide release, The Legend of Hercules, from Summit Entertainment and Millennium Films. Starring Kellan Lutz of the Twilight Saga, Scott Adkins of The Expendables II (and 4 time Jean-Claude Van Damme co-star) and Liam McIntyre from television's Spartacus: Blood and Sand and directed by Renny Harlin of Deep Blue Sea and Die Hard II fame. TV writer Daniel Giat gets his first big screen credit with the help of 2011's Conan the Barbarian scribe Sean Hood. The short and simple story opens with Adkins' King Slayer Amphitryon latest hostile takeover of yet another Greek city. His wife and queen Alcmene disapproves of his blood lust and prays to Zeus for someone to stop him. In her bed that night, thunder rolls as she writhes and is given the seed of a god. Son Hercules is born with no idea who his real father is and grows into tan and muscled Lutz (who has really white teeth). When it's announced his love Hebe (Gaia Weiss) is to marry older brother Iphicles (Liam Garrison), The Herc protests and is quickly sent to Egypt with a squad of soldiers led by Captain Sotiris (McIntyre), where they're set up and nearly killed by a band of ruthless mercenaries headed by Tarak (Jonathan Schaech of That Thing You Do! and Road House 2). Sold into slavery, the duo quickly make a name for themselves in the pit fighting circuit and find their way back to Greece for a chance to avenge their fallen comrades and get the girl. Finding out you're a demi-god, lion wrestling, jump punches, slow motion flips, circular Dolly shots, ripped pecs, chiseled abs, sword clashing, He-Man referencing, full moons, thunder whips and single shoulder pad action shenanigans ensue. From the look of the trailers, I was expecting a schlocktastic good time from a capable but aging director hungry for a big movie comeback starring a young pretty face whose physique would fill in for acting. Neither of those expectations were quite met as The Legend of Hercules isn't completely enjoyable but is totally watchable. 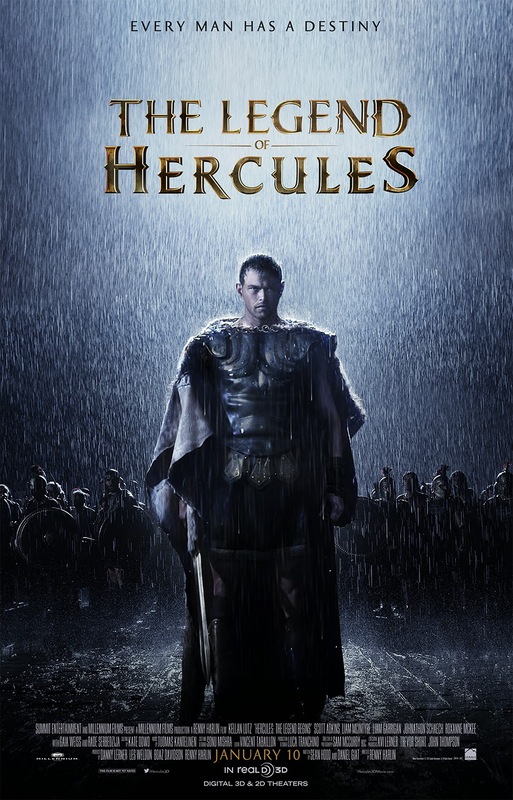 From the surprisingly solid 3D (flying arrows, rain, dander) that gave a sense of depth to the impressive set design to the straight forward but not self serious tone to frequent, kind of exciting action scenes (bogged down by random slow motion), Hercules is a lot more polished and sturdy than you'd expect. Lutz's performance doesn't get too deep but he does fine with what's asked of him. Adkins furrows his brow and sneers through his performance while McIntyre gets to play sympathetic and heroic as Herc's right hand man. Clocking in around 90 minutes, the story moves so quickly from beat to beat and action scene to action scene that the flick is never given a chance to breathe so there is very little dramatic tension to all the goings on. As it stands, The Legend of Hercules finds itself in the middle of the heap of mythic action movies as it's not as fake looking and drawn out as 300 or as morbid and draining as Immortals. The film lacks the scope and fun of Clash of the Titans, the crude epic-ness of 1982's Conan the Barbarian and the straight bad-good cheese of Kull the Conqueror. But it's still a lot easier to watch than Millennium's own 2011 rendition of Conan which put me to sleep. Thanks for the reveiw. Glad that it's not as disgusting as I expected. Hello from VanDammeFan.Net. Thanks for reading, Alik. It's a shame it will be a punching bag for critics and people who have no intention of seeing it but it's far from the worst movie ever made or a train wreck.